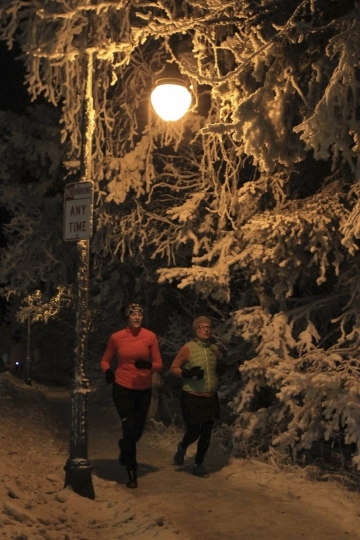 ANCHORAGE, Alaska — Darrell Bachmann doesn't wear ruby slippers, but when he clicks his heel, something magical happens. 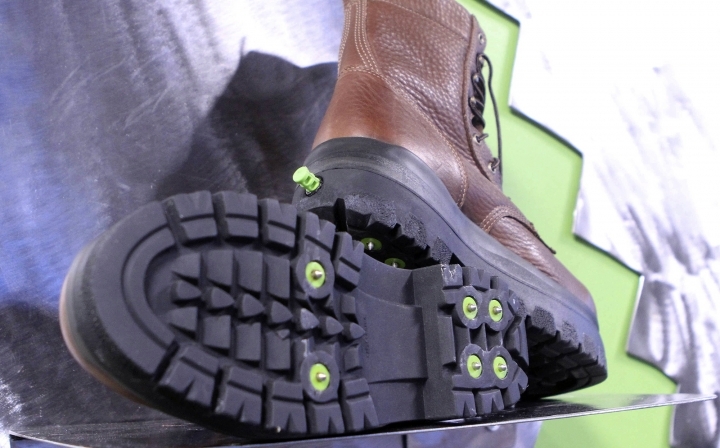 Bachmann invented KickSpikes, a boot designed to walk on ice. Kick a button on the heel and 7mm steel cleats pop out. Kick the button again and the cleats retract, allowing the wearer to walk inside without tearing up floors. "Traction on demand," he says. 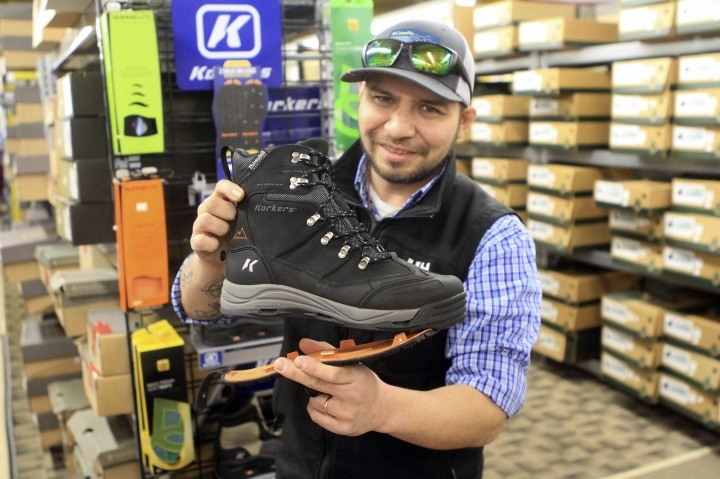 Bachmann's boots are the latest option for secure footwear in Anchorage, where streets are icy up to seven months per year and falling could mean a broken wrist or worse. 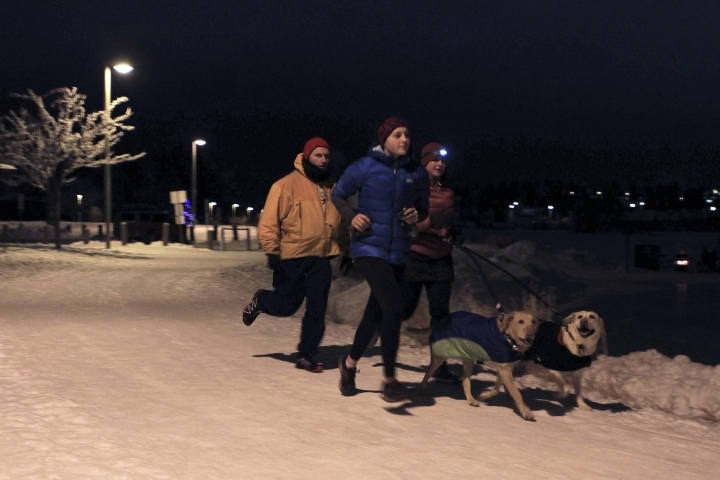 Alaskans, like Scandinavians, look for technology that will allow them to embrace long winters, said John Clark, running shoe buyer for Skinny Raven, an athletic gear store that caters to runners. The store carries three brands of shoes for running on ice. That niche market, like trail shoes, didn't exist a few years ago. "People see those types of things and go, 'This is a tool for me to not just survive winter, but more likely conquer winter,'" Clark said. The Toronto Rehabilitation Institute tested 98 winter boots in a study released Nov. 24 and found only 8 percent met minimum slip resistance. None of the tested boots had cleats. No one shoe is perfect for all applications, Clark said, but there are plenty of options for getting outside. 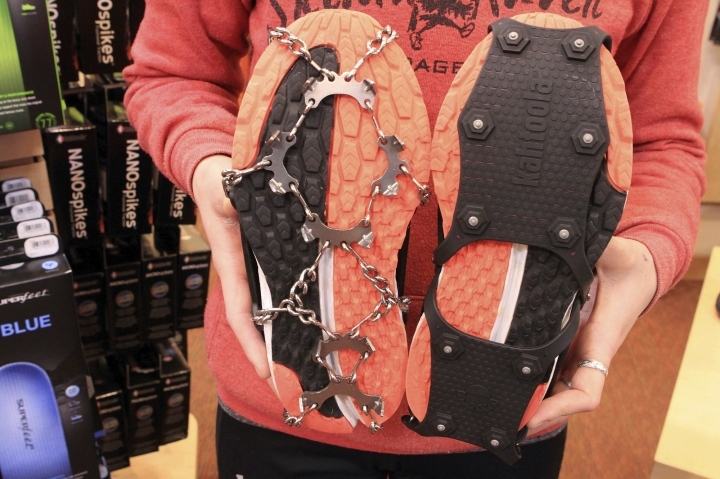 Strap-on cleats — mini versions of crampons used by mountaineers — make any shoe an ice shoe. Held on by straps or rubber harnesses, they stretch from toe to heel and put steel teeth on a shoe bottom. They remain a popular choice in Anchorage because they can be transferred between shoes and removed to enter a store. The price: $10 to $70. Strap-on cleats can pinch soft running shoes. 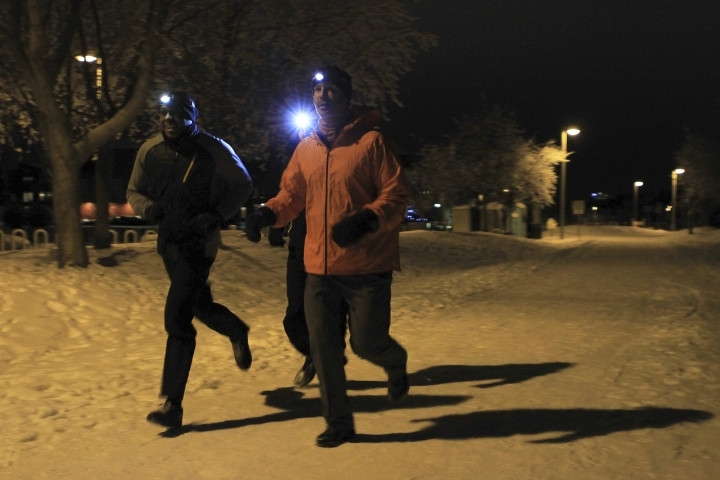 Swedish manufacturer Icebugs was one of the first to offer running shoes with cleats. Their bottoms are flecked with tungsten carbide studs. The shoes' popularity led to competition. Skinny Raven offers studded running shoes from two other European manufacturers, Salomon of France and Inov-8 from Great Britain. They range in price from $150 to $220. Galoshes used to be the norm for northern schoolchildren. Neos Overshoe and Tingley Rubber Corp. offer studded overshoes with uppers like wide gaiters that easily fit over a shoe or boot. They're waterproof and offer an added layer of warmth. Prices start at about $120. "Very handy for the person who doesn't like to take off his shoes and put on another one," said Stewart Valladolid, boot buyer at B&J Sporting Goods. One Anchorage flightseeing company provides tourists with the non-slip footwear on flights to glaciers. "A lot of their clients come unprepared," Valladolid said. "This way, if they're wearing regular dress shoes, they can pop these on and not lose their toes." Tingley and LaCrosse also offer more traditional rubber overshoes with studs. For a warm hiking boot with cleats, Anchorage stores offer Korkers, boots with interchangeable outer soles. Agile users can peel off a rubber outsole and snap on one with cleats without taking the boot off. Prices start at $180. For the fashion-conscious, Canadian manufacturer Pajar offers boots with a hinged insert on the bottom. Flip the insert and cleats appear. Women's versions have been popular with customers who have had hip or knee replacements, said Alexa Ives, a manager at Shuzy Q, a downtown boutique. Prices start at $240. Men's versions are available online. And then there are Kickspikes. Bachmann set out to invent a golf shoe with steel cleats that could be retracted so they didn't tear up greens. "It turns out that golf is half of 1 percent of the market we're after," he said. "We went full-fledge into boots." One model is aimed at hikers. Some feature safety toes. In industrial settings, users can transition out of cleats without bending over if they have to climb a ladder or walk into a building. The soles are slightly taller and wider than a regular boot but Bachmann swears by their stability. A video on the company website shoes him racing behind a Zamboni ice resurfacer between periods at a hockey game. Prices start at $350. Valladolid one day received an appeal from a gentleman with feet so wide, he could not find winter boots. The man navigated Anchorage in flip-flops but took a nasty fall. Valladolid showed him Goat Head Sole Spikes — cleats that screw into the bottoms of almost any shoe. A $24 kit includes spikes and a handle to install them. "We studded out his sandals and he was very happy," Valladolid said. Skinny Raven offers a similar service. For $10, the store will drill case-hardened screws to the bottom of shoes. The service is free for anyone pregnant, disabled or over 60. "We just don't want people getting hurt," Clark said. "We don't want that to be a limiting factor for people. It's not that big of a deal for us. We should be doing something nice for those people to encourage them to be out."